Orchid flower composition | Delivery flower basket to Kiev. Kiev florists create beautiful compositions with different flowers. 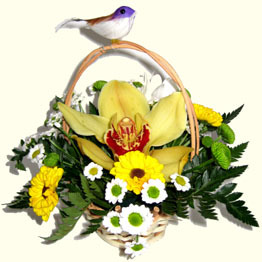 The main element of this bouquet is a majestic orchid in the center of the basket. Couriers will deliver this floral arrangement within 24-48 hours after receiving your order. The Flower delivery service has been at your srvice since 1999. P.S. Delivery in Kiev ONLY.